Do you want to create setup installation file from existing executable file, try this cost effective, user friendly and powerful setup maker software which facilitate software developer of any organization to create small size installer file. 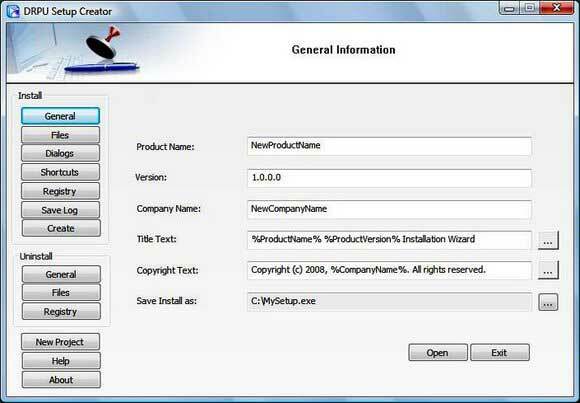 EXE builder application allow user to generate installation package with specified company name, product name, title text, product version and other relevant general details from text (*.txt) file. You can insert various shortcuts, dialogs, registry path, destination path, launch program and end user license / distribution agreement (copyright text) either written in English or Non English (Unicode character architecture) character. Installation wizard builder program facilitate to save generated small size setup file at user specified location of its laptop or desktop computer. We ensure that generated EXE can be easily installed at any system configuration having Microsoft windows operating system including all Vista editions. Application does not require any additional hardware and software or any type of programming or scripting language to produce executable installation wizard. We suggest you to download freeware demo edition of software which contain inbuilt help manual and assist to aware with software working and procedure. Setup maker software features: * Generate small size of setup package from existing executable file and other relevant data. * Facilitate to add user define company name, product title, version etc. * User can add shortcut, dialogs, registry path and EULA (support Unicode character). * No supplementary hardware, software or programming skill is required. * Generate EXE file in few mouse click as per describe in help manual. * Support all Microsoft windows operating system like 98, 2000, NT, ME, XP and Vista. * Provide complete install and uninstall support. * GUI based application easily used by non technical user.